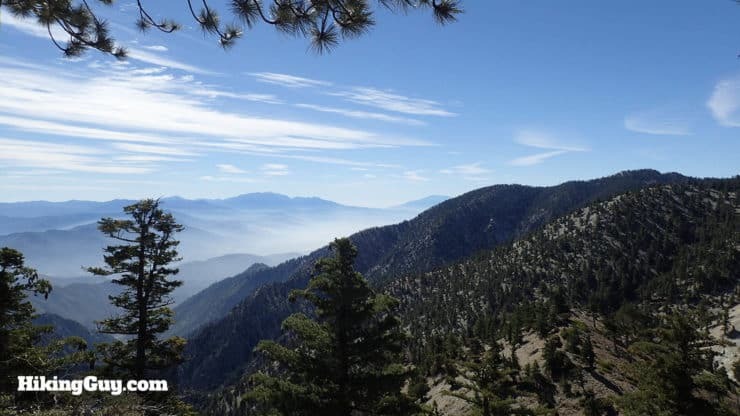 The Three T’s Trail hike is one of the more peaceful hikes in the Mt Baldy area. 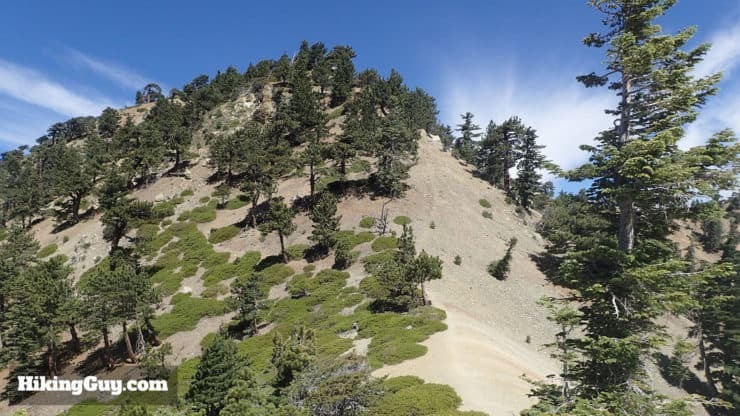 This loop hike starts at Icehouse Canyon, climbs to Icehouse Saddle, then hits Timber Mountain (elevation 8,303ft), Telegraph Peak (elevation 8,985ft), and Thunder Mountain (elevation 8,587ft), and then descends down to Baldy Notch, Manker Flats, and back to Icehouse Canyon. 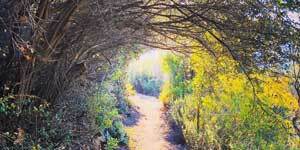 It’s a long hike, but a favorite for those avoiding crowds. This is a long, tough hike. 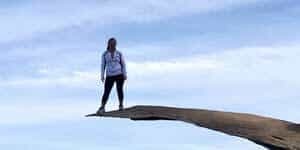 Don’t attempt it if you haven’t done long mountain hikes and if you don’t have a good level of fitness. Start very early to avoid the heat in summer. 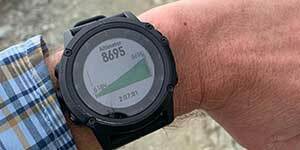 Likewise, if there’s snow and ice on the route, don’t attempt it unless you have winter hiking and mountaineering experience. 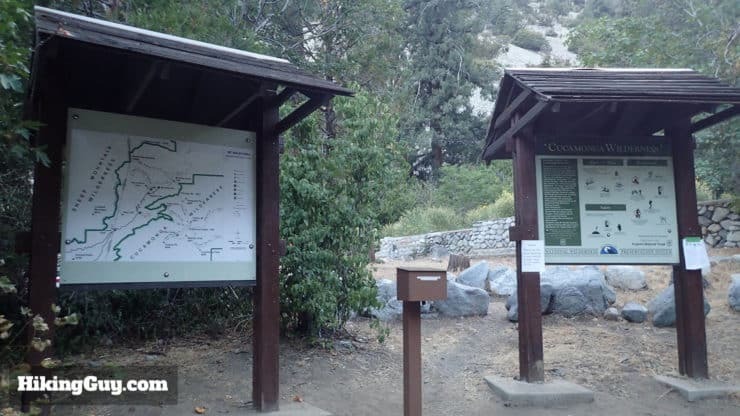 The hike starts and ends at the popular Icehouse Canyon Trailhead. 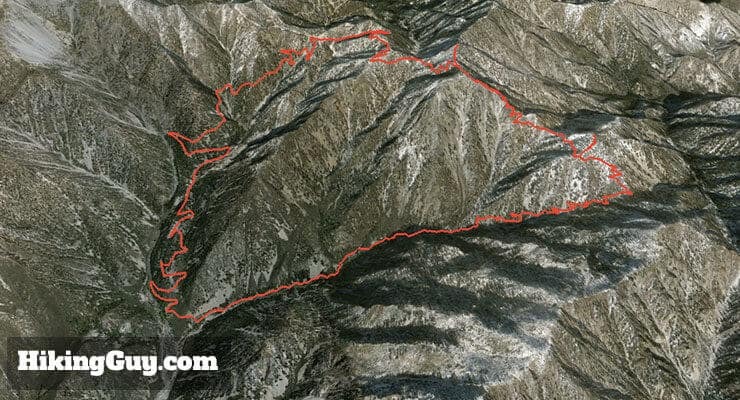 Use this as the trailhead address: Ice House Canyon Rd, Mt Baldy, CA, 91759, USA. 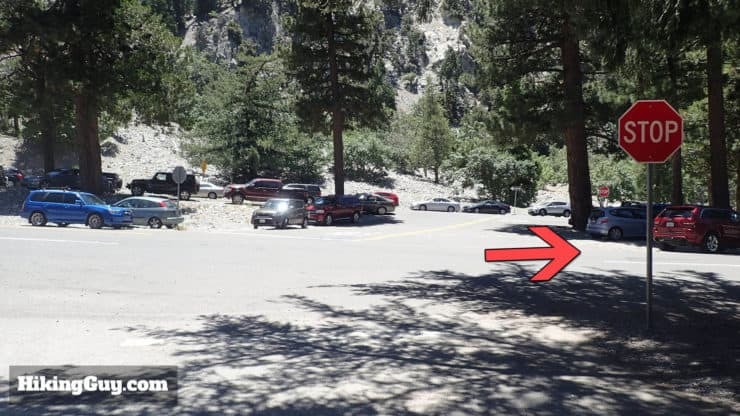 You need a parking pass for the Icehouse Canyon Trailhead lot. I use the affordable National Parks Pass, which gets me in every park, monument, and national forest. 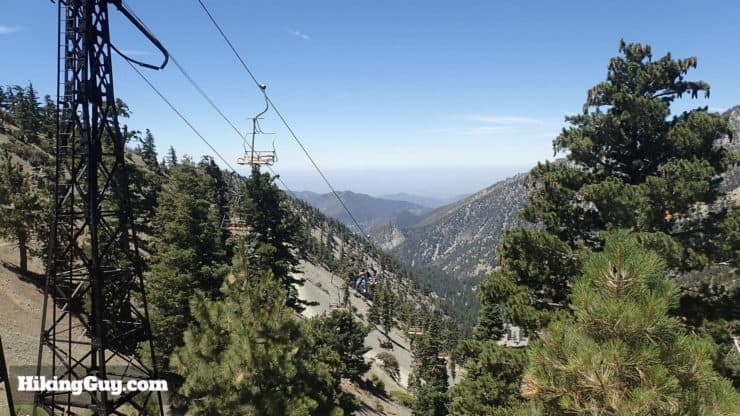 You can also use a (Southern California only) Adventure Pass, or buy a $5 day permit from the visitor’s center. 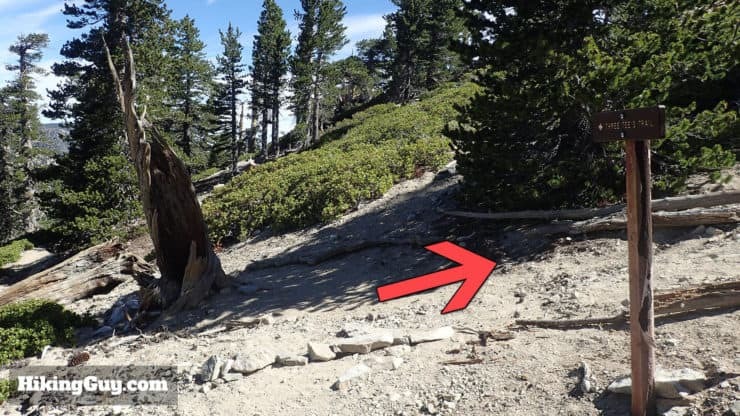 This is a backcountry hike and you should prepare accordingly. 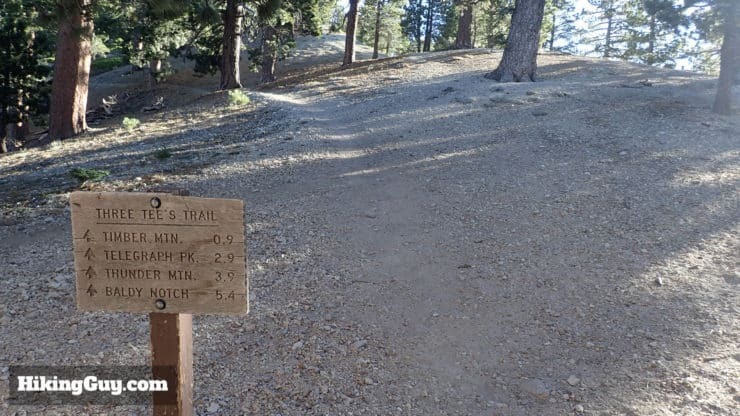 It’s also a hike best left for times when there’s no snow or ice. 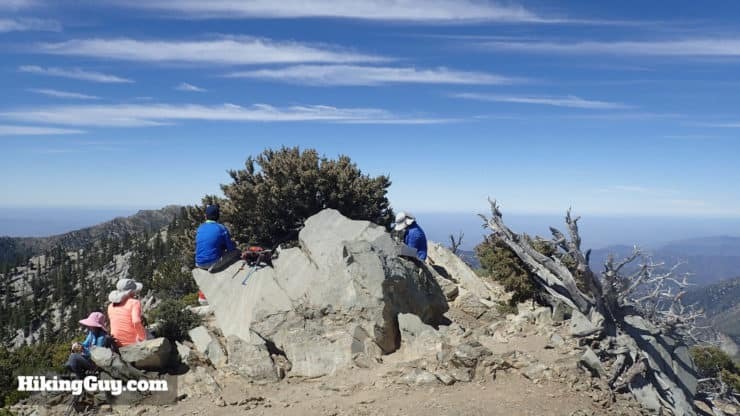 Telegraph Peak is a great place for a lunch or snack break. You can also eat at the restaurant at Baldy Notch on the way down. My best lightweight pack for hikes between 3-10+ hours. I use mine with the 3L water bladder from Osprey. I use a light inner toe sock and then a top-quality outer sock to prevent blisters. 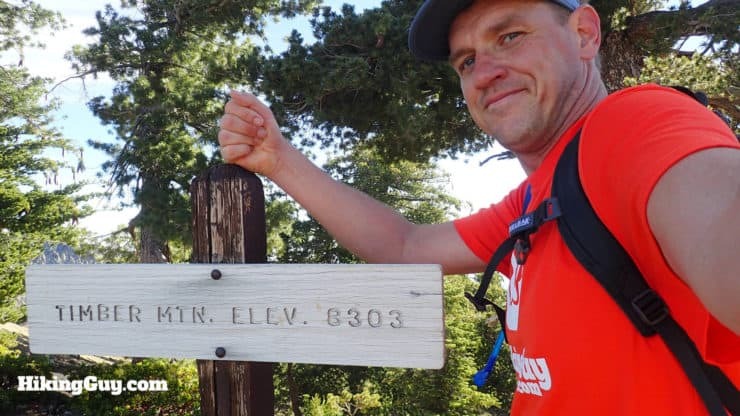 There’s a lot of great hiking clothing out there, but what I especially like about the Kuhl stuff is that it’s not too geeky, it’s high-performance, comfy, and I can wear it in real life too. No company pays me to promote or push a product, all the gear you see here is gear I use and recommend. 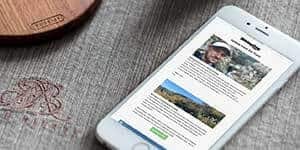 If you click an REI link and buy gear, I get a small commission that helps offset website expenses. There is no cost to you. 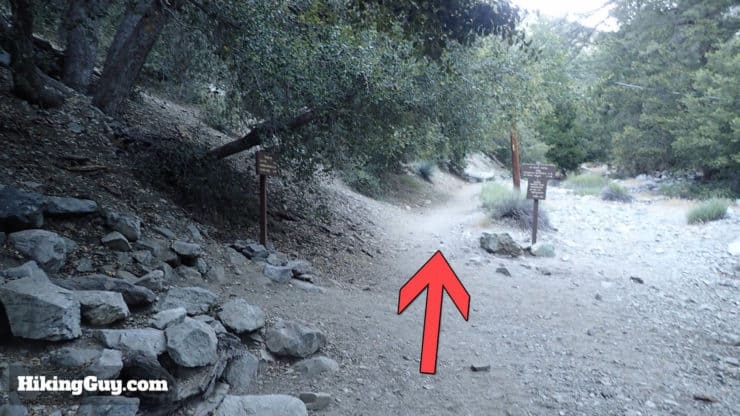 These directions are for a loop hike. 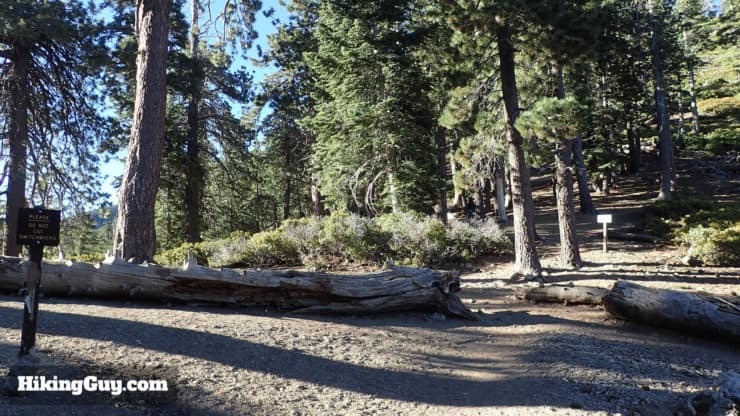 It’s designed to let you take in the beauty of the Three Tee’s Trail and then you have a nice long descent back to your car. 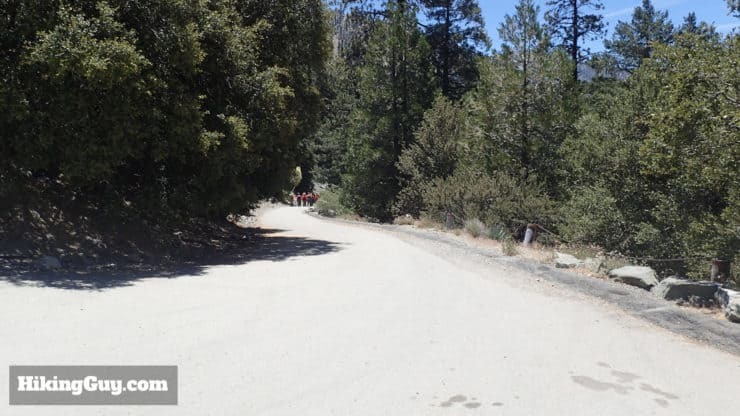 The descent includes a road with cars for a bit. 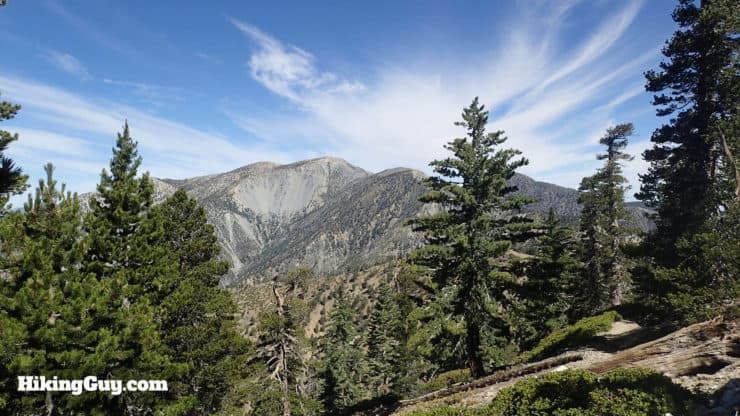 If you want to avoid the more developed portions of the hike, simply hike to Telegraph Peak and return the way you came. 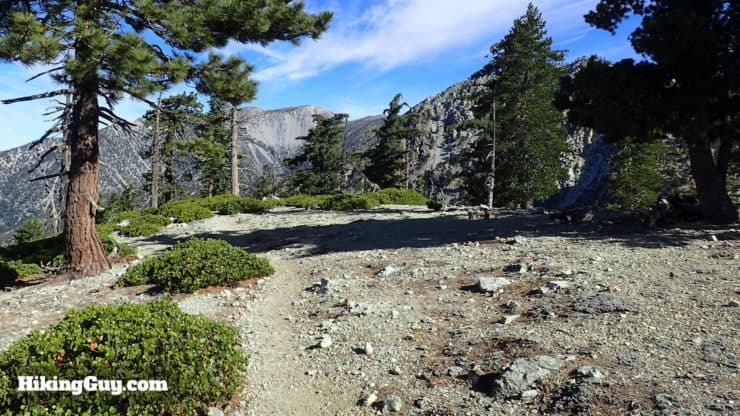 After climbing up to Icehouse Saddle, the Three Tee’s Trail follows the ridge line down to Baldy Notch. From there it’s all downhill. 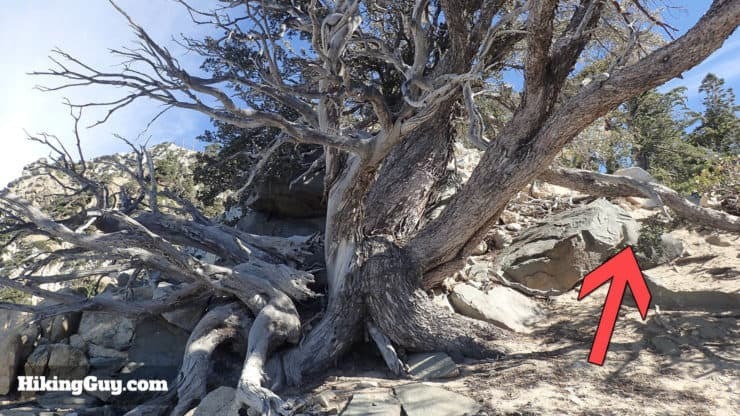 There’s a lot of climbing on this hike. The toughest climb is the one to Telegraph Peak (in the middle). 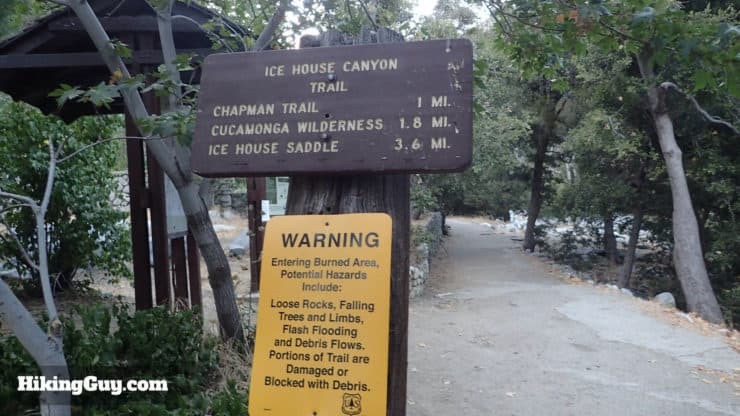 The hike starts at the end of the Icehouse Canyon Trailhead parking lot. Don’t forget to display your parking pass on your dashboard. 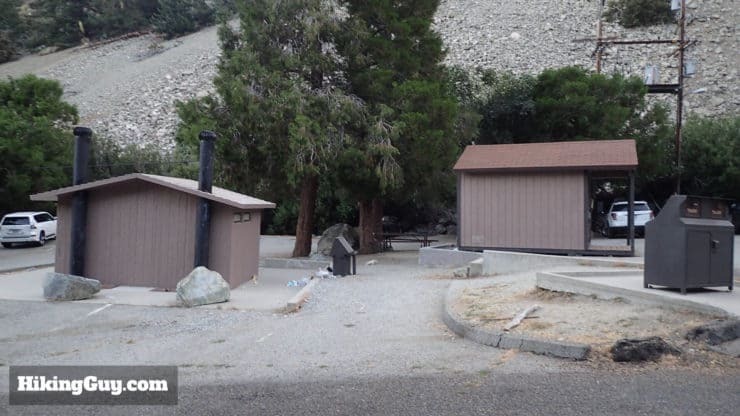 The Icehouse Canyon Trailhead parking lot has bathrooms. Not the prettiest but they work. Look for this trail sign at the start of the trail. 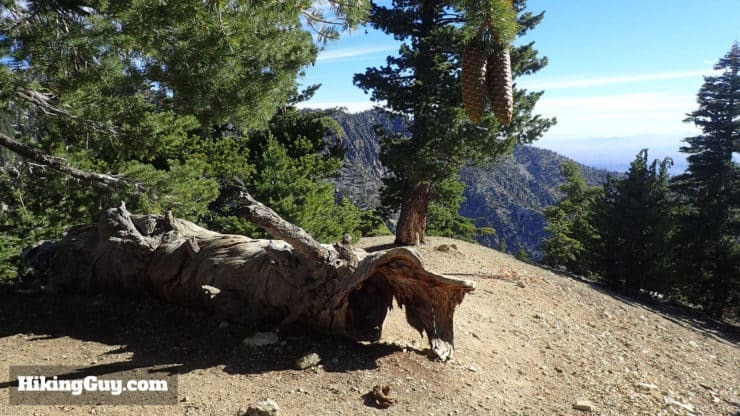 You’ll be hiking to Ice House Saddle. 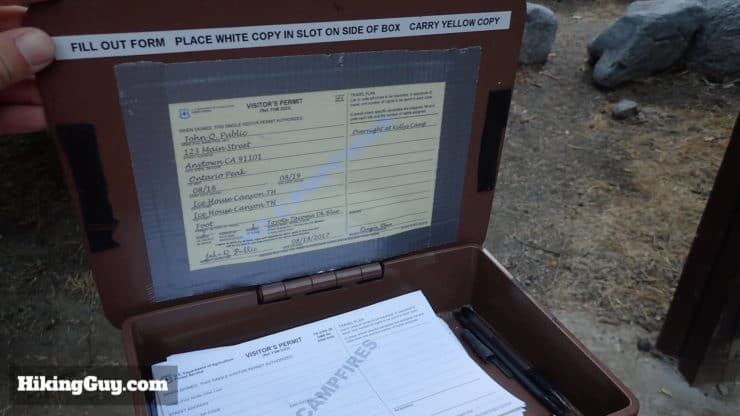 Before you hike, you need to fill out a free permit. 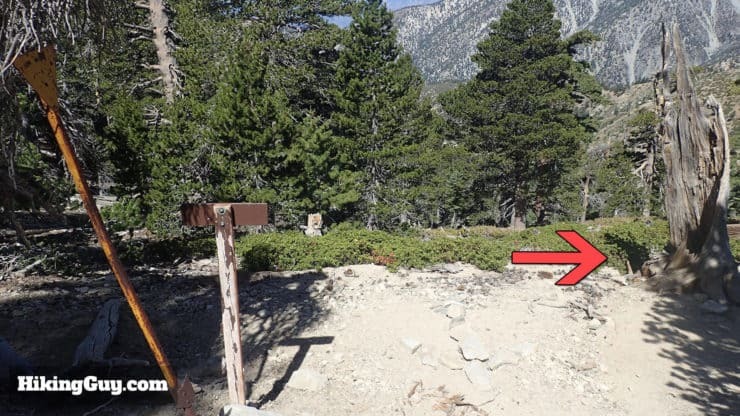 The permits are located in the small brown box between the hiking boards at the trailhead. Filling out the permit is pretty simple, just follow instructions. If there are no forms left, grab a napkin or piece of paper from your car and do your best. You can also get more permits at the visitor’s center. 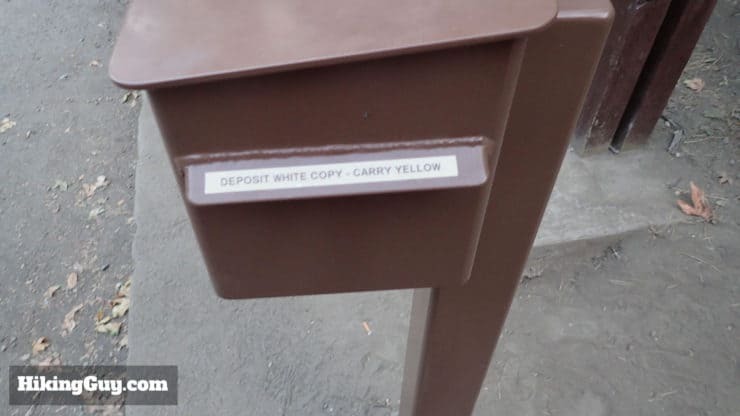 Drop the white copy of the permit in the side of the box, and keep the yellow copy on you until you’re done with the hike. 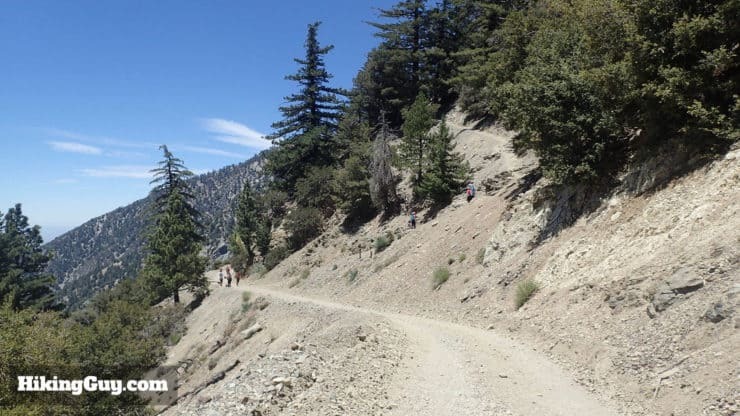 The Icehouse Saddle trail starts climbing along Icehouse Creek right away. 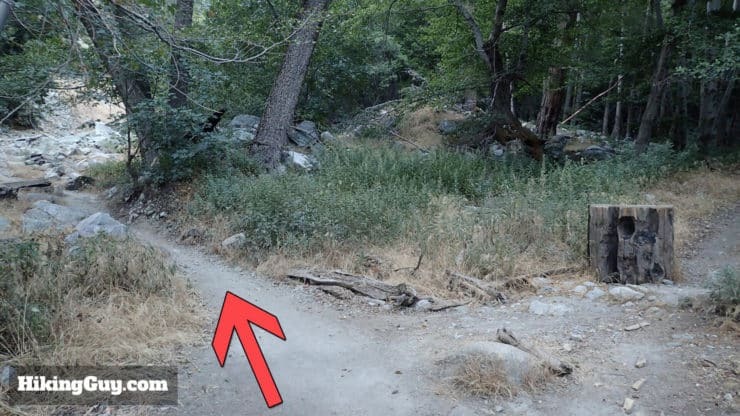 Avoid any small side trails to the right that head down to the creek. 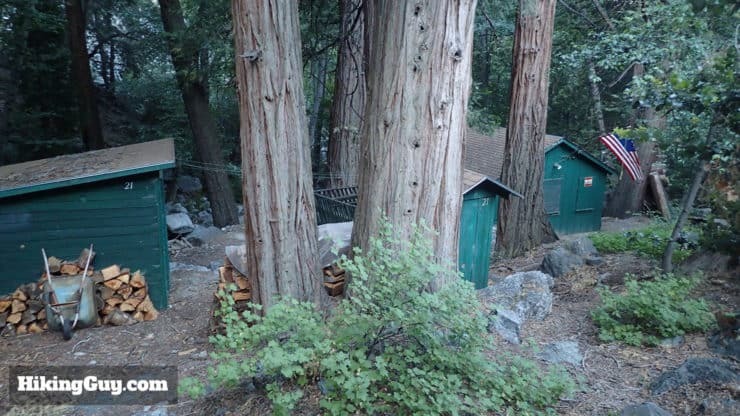 There are some private cabins down here. Respect people’s property and stay on the trail. 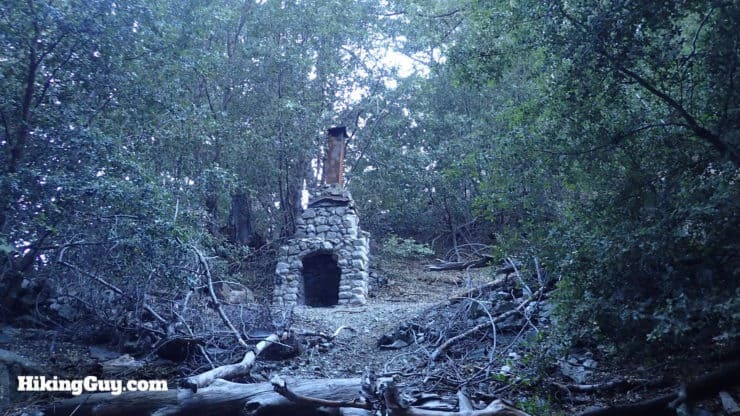 Keep your eyes open for old ruins of cabins as well. About 1 mile in you come to the Chapman Trail junction. 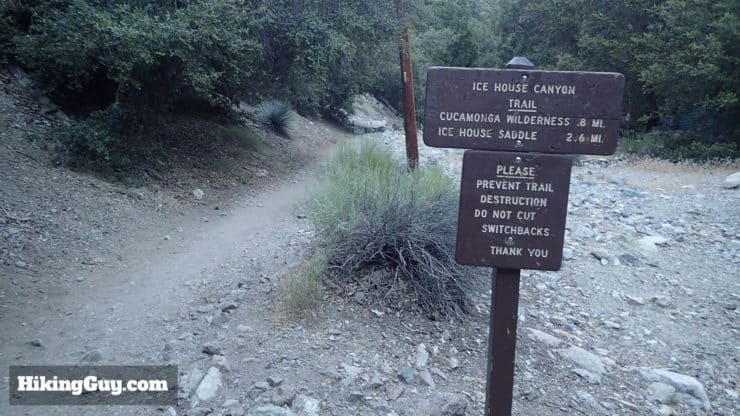 Stay straight to Icehouse Saddle. The trail is well marked with signs. 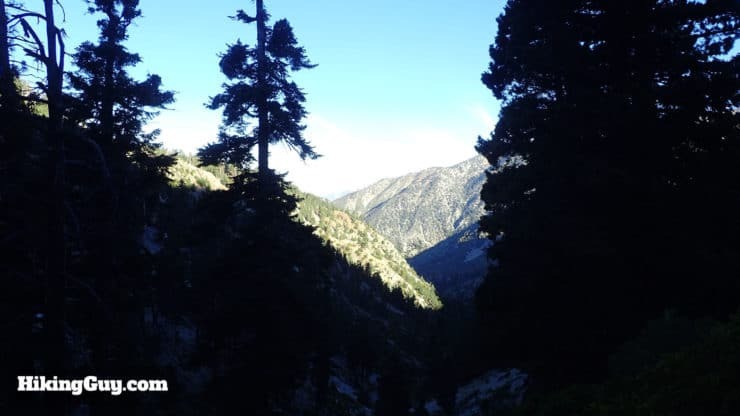 At just under 2 miles in, you reach the border with the Cucamonga Wilderness. Just keep going straight. You’ll notice the scenery starts to change around this point and feels more alpine. 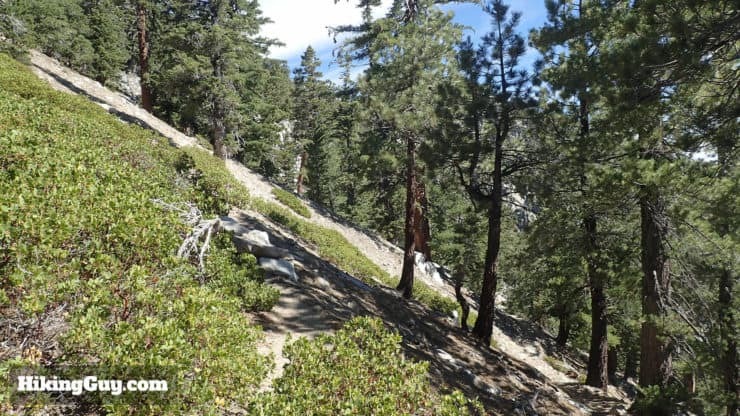 The trail starts to climb on a series of switchbacks. 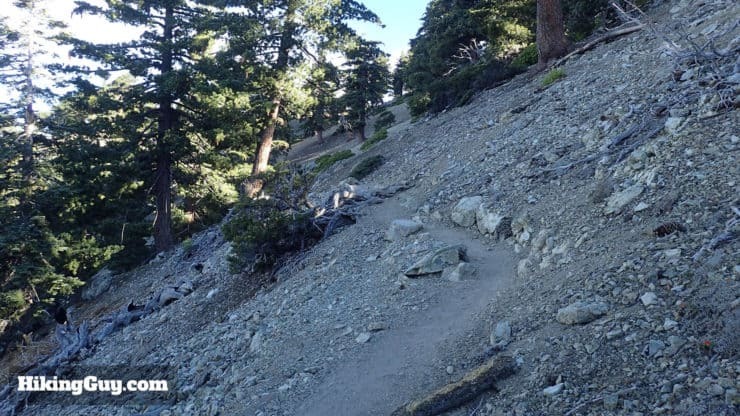 Avoid any small side trails and stay on the switchbacks. Easy to miss a turn when you’re working hard and your head is down. Don’t forget to turn around and take in the mountain views. 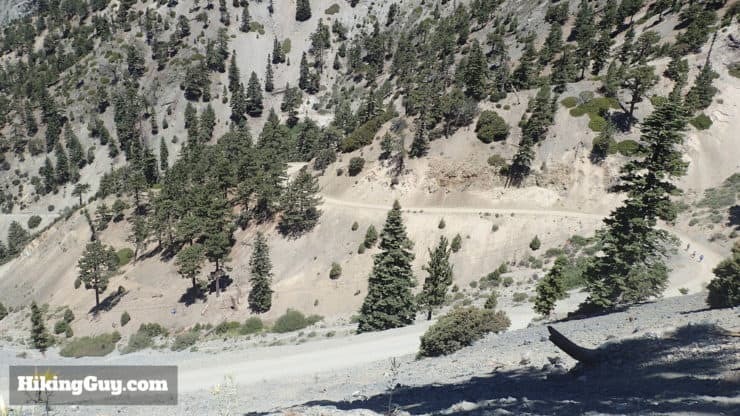 Even on this first section, you’ve climbed quite a bit. Eventually you’ll reach the junction with the Chapman Trail. 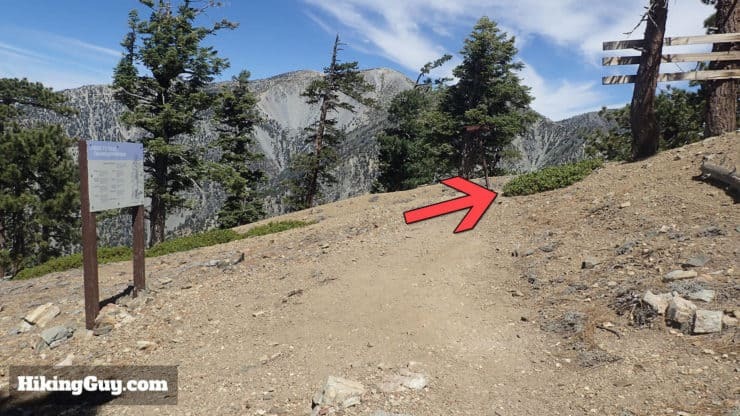 Hike to the right towards Icehouse Saddle. 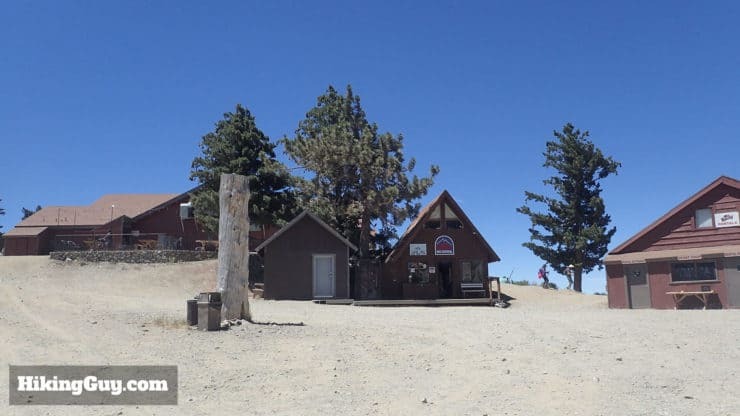 You made it to Icehouse Saddle! This is a big trail junction and a great place to refuel. 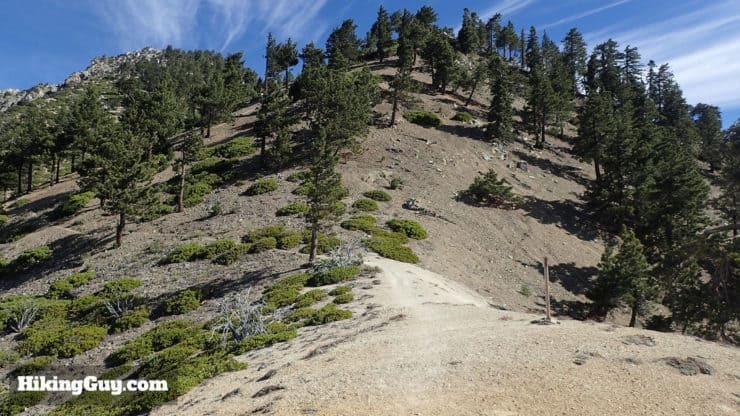 The Three T’s Trail is the hard left when you reach the saddle. All of the trails here are well marked. 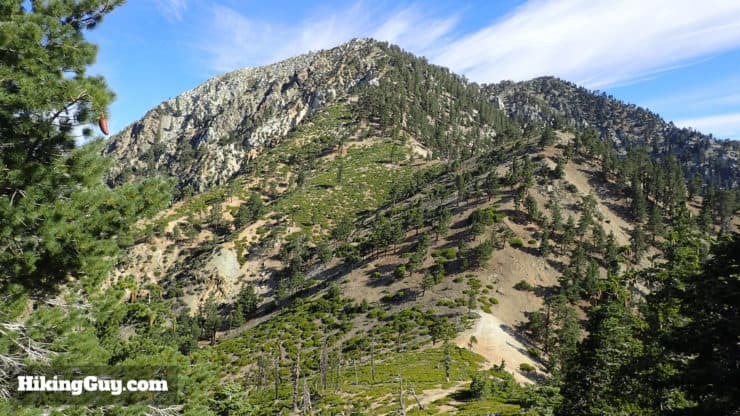 If you want to do some other great hikes from Icehouse Saddle, check out my directions for Cucamonga Peak and Ontario Peak. The Three T’s Trail quickly starts climbing again. You’ll (hopefully) notice less people after you start the Three T’s Trail. …you might see some wildlife. 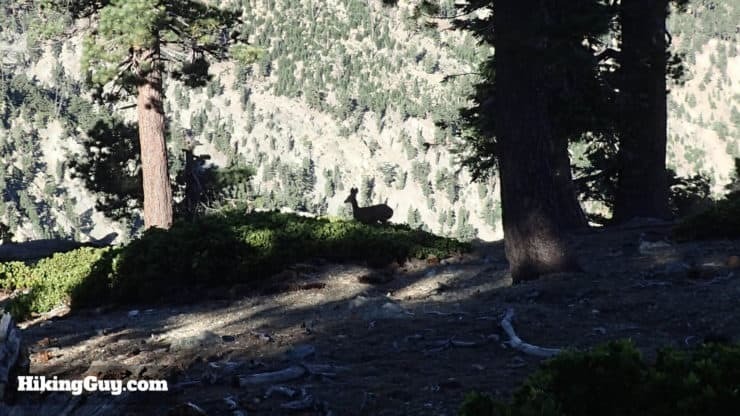 On this day I spotted a few groups of deer. 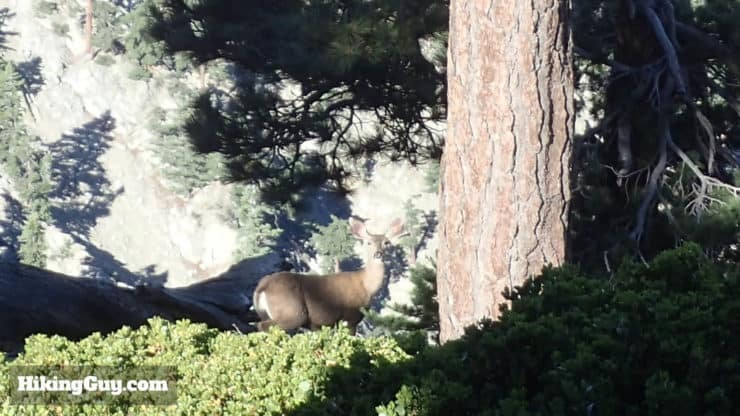 On other days I’ve seen bighorn sheep. 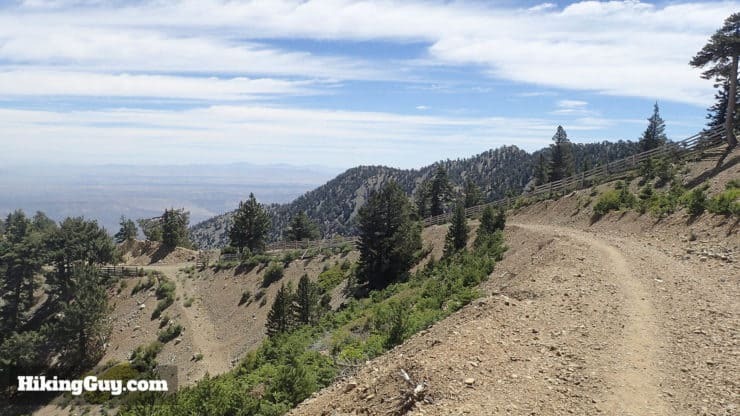 The spur to Timber Mountain is about 0.7 miles after Icehouse Saddle. Hike to the right up to Timber Mountain. 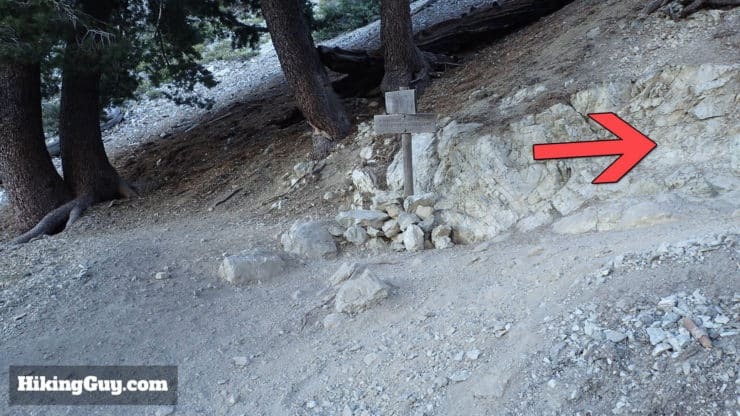 Again, the trails are pretty well marked here. 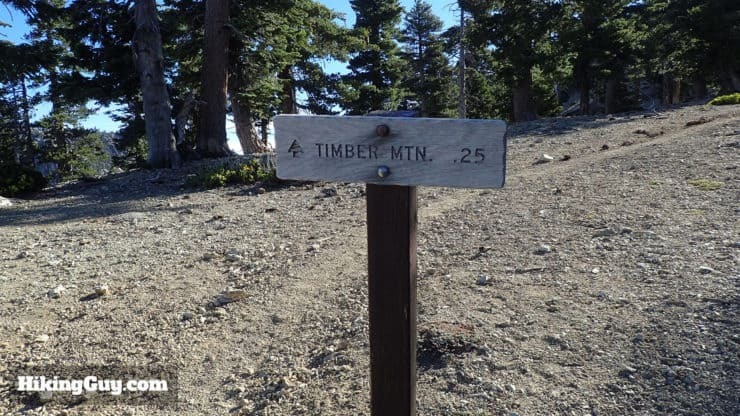 The trail to Timber Mountain is small but easy to follow. 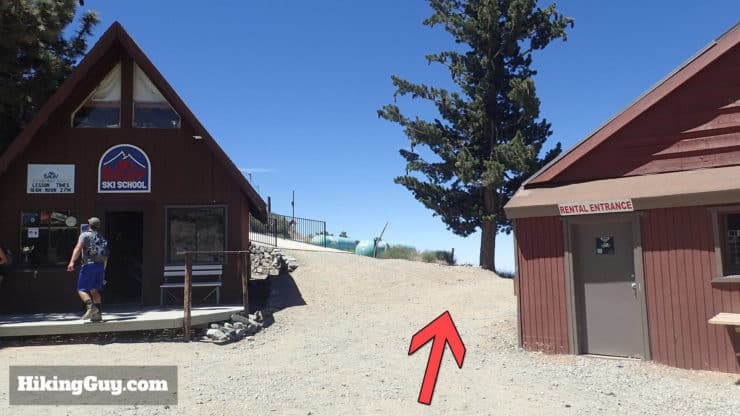 Grab you summit selfie at the Timber Mountain summit sign. There’s a little area a few feet to the east of the summit with great views. A good place for a snack. Head back down to the Three T’s Trail and continue. You’ll start to climb once again. Telegraph Peak is actually past this summit. The views start getting incredible here. As you cross some small mountain saddles, your views to the east will start opening up. 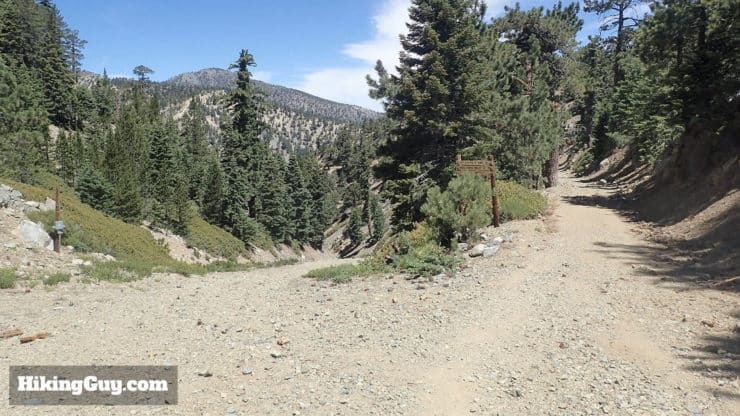 There are a lot of false summits as you climb toward Telegraph Peak. 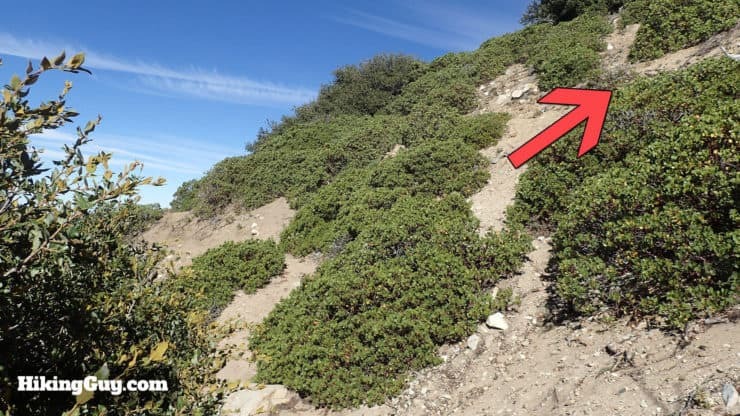 There was one section on the climb in some manzanita where the trail dead ended on a cliff. 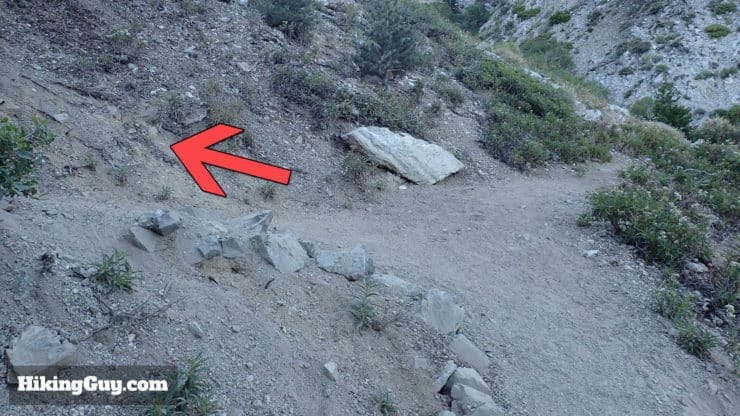 If the trail dead ends or gets dangerous, turn around and head up, you probably missed a switchback. If it was a winter with a lot of precipitation,this part could be very overgrown and you’d probably benefit from long pants. 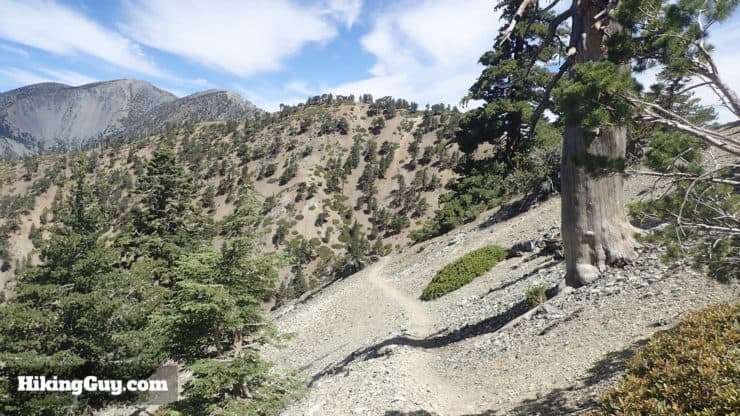 Head up the switchbacks on the Three T’s Trail. 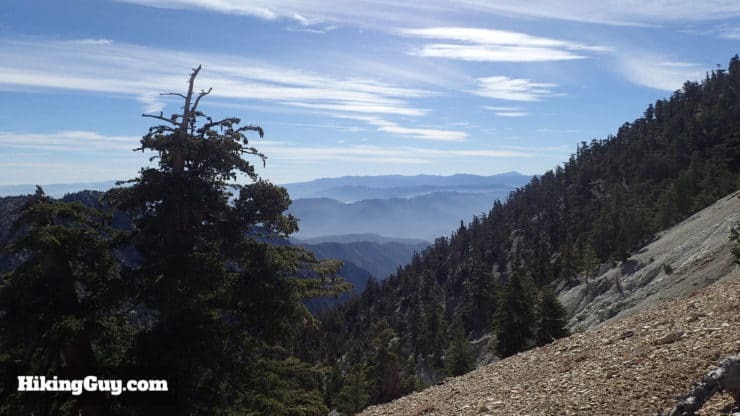 Look back and to the right as you climb for views of San Gorgonio. There’s another rocky section where it’s easy to loose the trail. 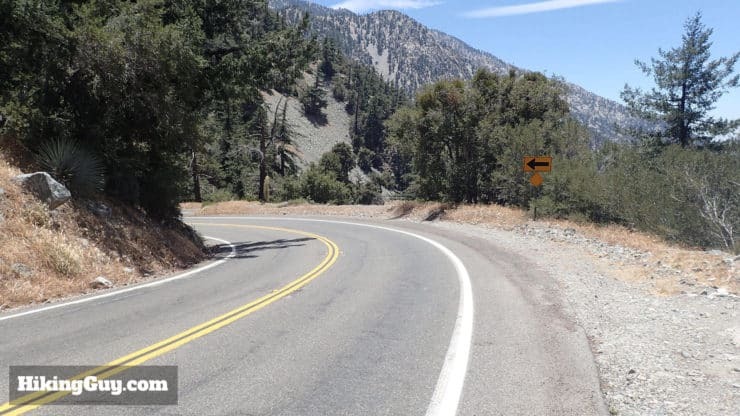 Again, look up and back for the switchback. 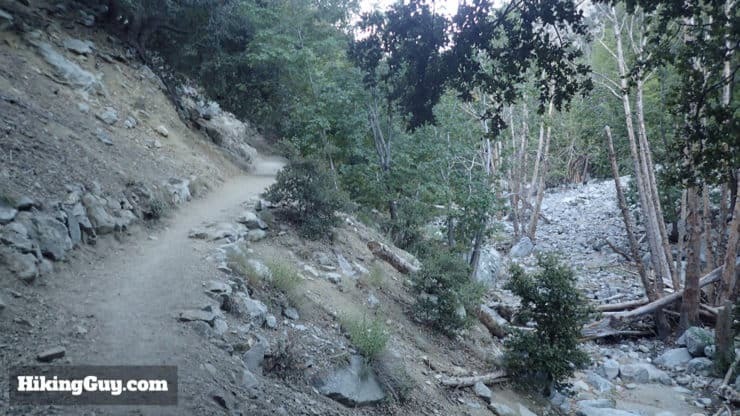 The trail is less defined on this stretch, but still visible. Just keep your eyes open. Almost there! 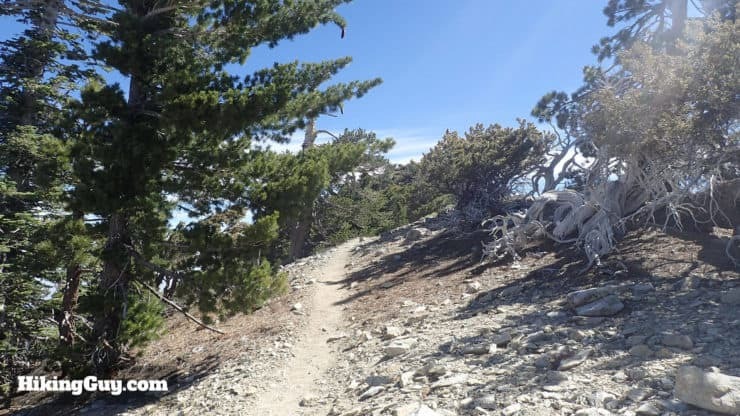 The trees get thinner as you climb toward Telegraph Peak. 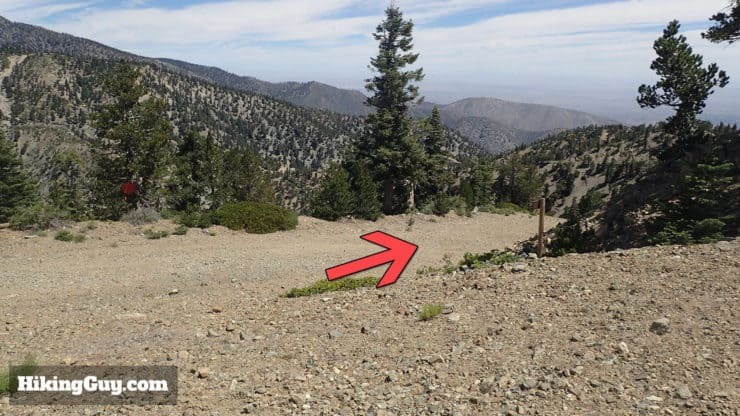 Soon you’ll start getting views of Mt Baldy in the distance. 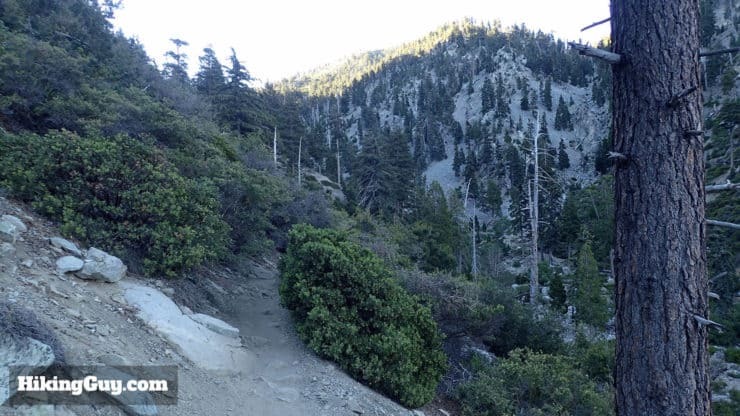 You reach the spur to Telegraph Peak. 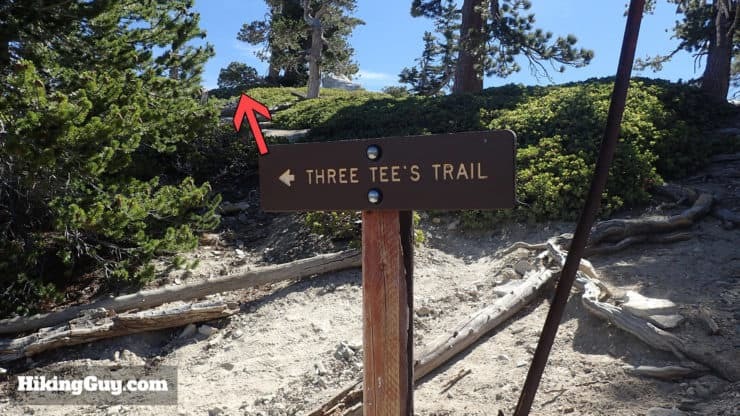 There’s no sigh for it, just a sign for the Three T’s Trail. 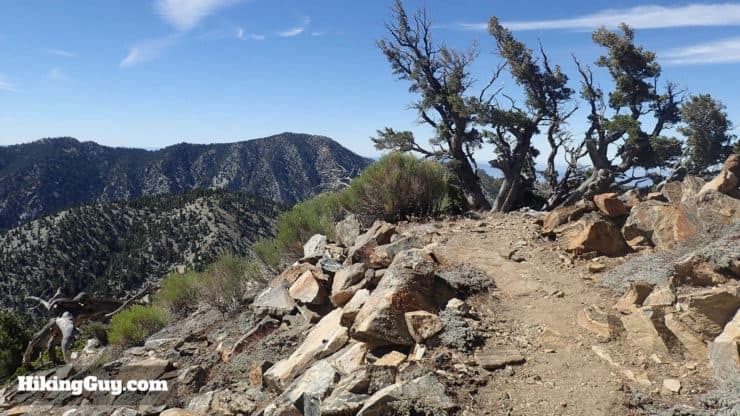 Make the right to hike up the spur to the Telegraph Peak summit. 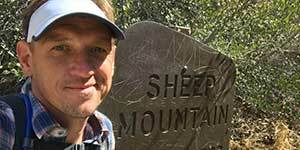 Here’s detail of the sign where you hike right on the spur to the Telegraph Peak summit. 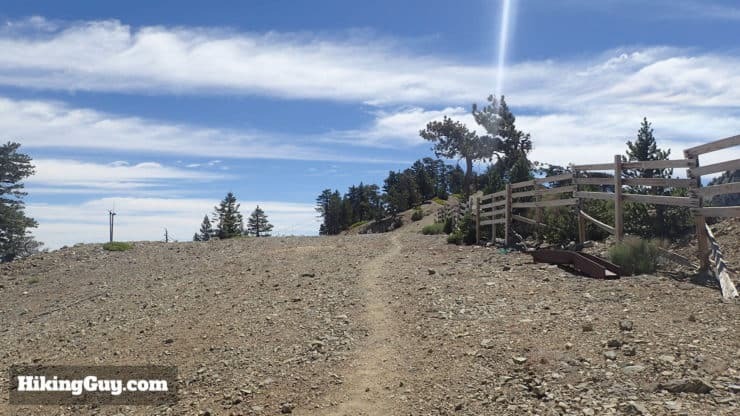 The spur to the Telegraph Peak summit is easy to follow. Here you are, Telegraph Peak. This summit is a great place for a break and snack. 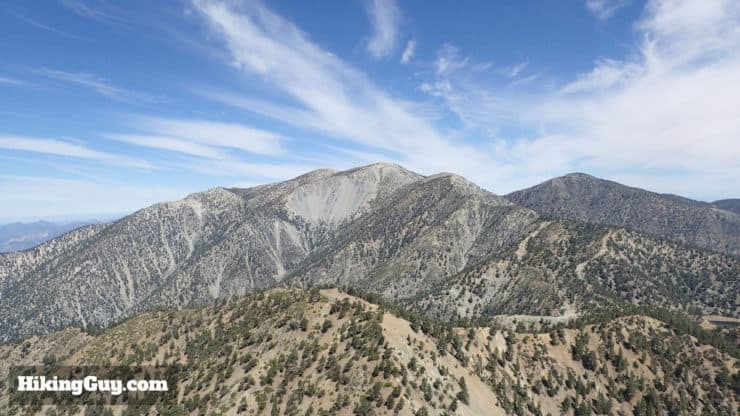 Telegraph Peak has good prominence, so you’ll get great 360 views, including Mt Baldy. 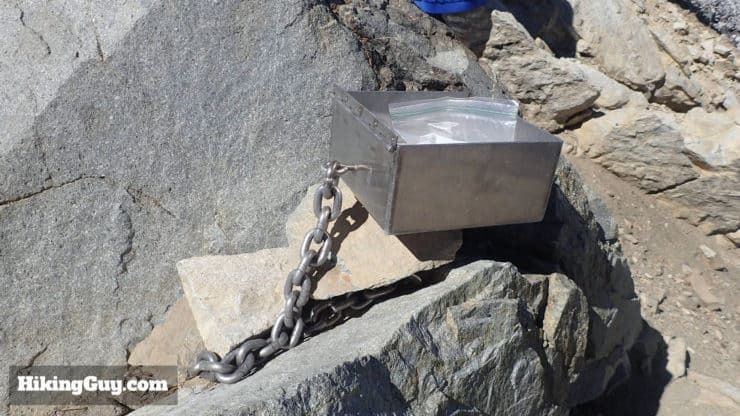 You can also sign the Telegraph Peak summit register. 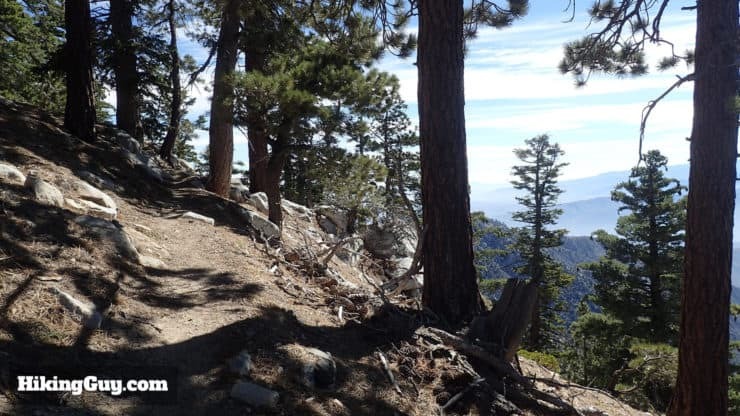 When you’re done at the summit, head back down to the trail and make the right. 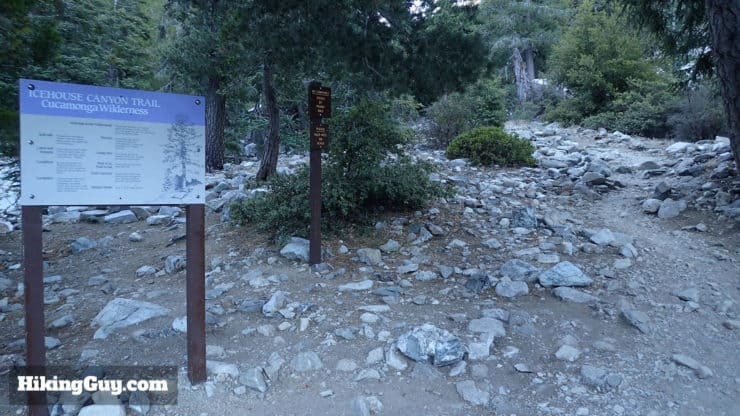 If you want to avoid the more populated trails, you can simply turn around here and retrace your steps back to the Icehouse Canyon Trailhead. The rest of the hike directions here follow a loop route back to the hike start. The Three T’s Trail descends down to the last saddle. 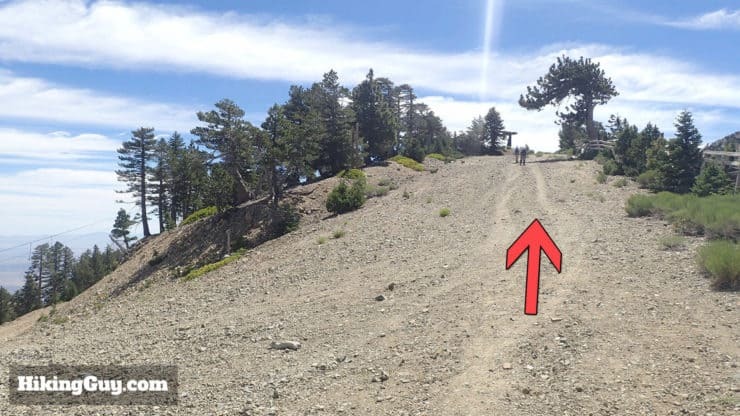 Here’s the last little climb on the Three T’s Trail to Thunder Mountain. It’s not so bad. You’ve reached the end of the Three T’s Trail! Make the right at the end of the trail. 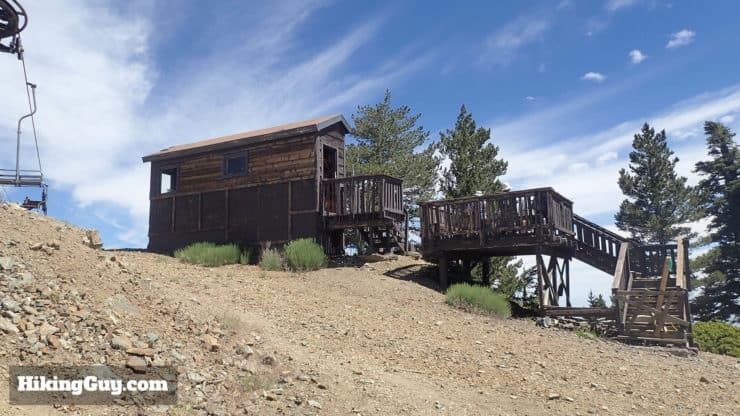 You’ll be in the Thunder Mountain ski area. 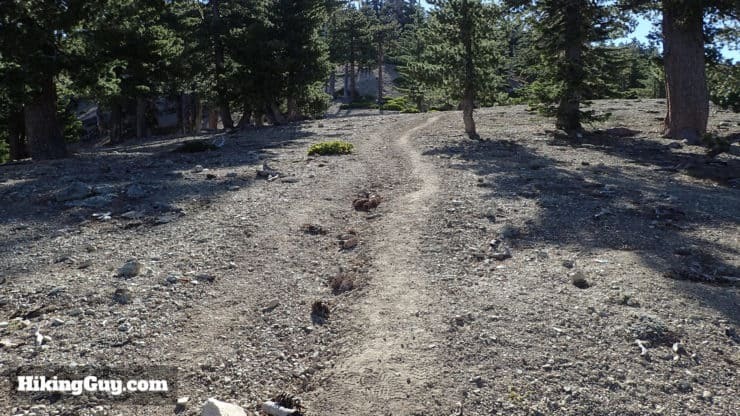 Continue straight on the trail in the Thunder Mountain ski area. 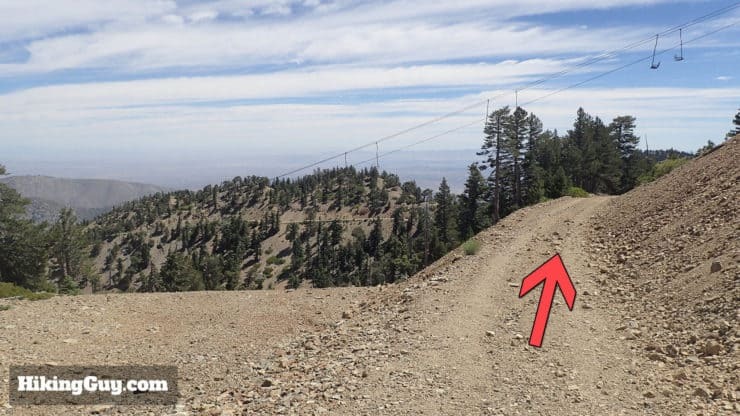 Hike to the right at the fork to the Thunder Mountain summit. Here’s the Thunder Mountain summit. Check it out and head back to the last fork. Make the hard right back at the fork. 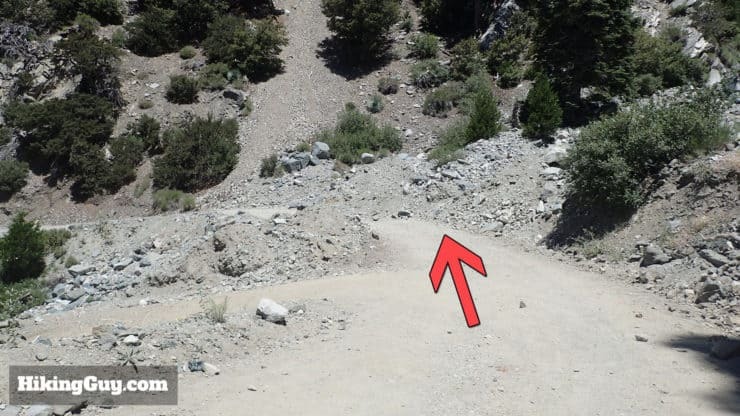 Avoid the steep ski run to the left and keep hiking on the dirt road. The road is easy to follow. You’ll see Baldy Notch in the distance. Baldy Notch is where you’re going. There’s a split. The sign says you can go either way. To the right the road continues and is longer, to the right you go down a (not too steep) ski run which is shorter. Choose your poison and head to Baldy Notch. You’re at Baldy Notch. Here you can ring the big bell, get a bite to eat, or just continue through. You’ve got options. If you do want to eat, it’s all downhill from here, so feel free to gorge yourself. The trail to continue down the mountain is by the ski rental joint. Head down the dirt road. This is the start of about 6 miles of descending. Enjoy it, you’ve earned it. You can take ski lift up to the notch if you want to revisit. If you look down you’ll see the trail winding down below you. You’ll be following this all the way down. When you come to the first intersection, make the right to continue on the dirt road. 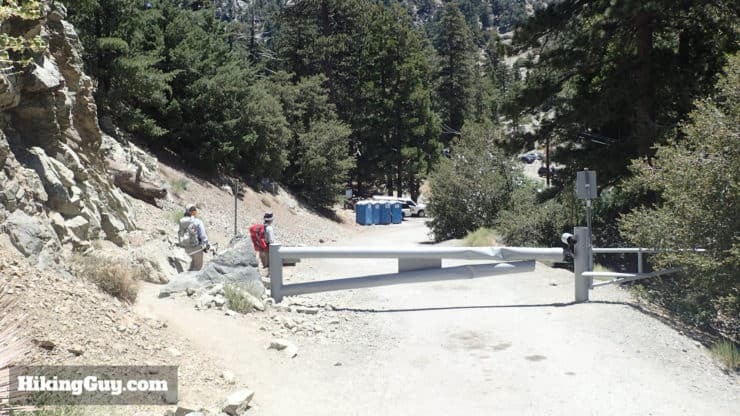 After a while there’s a side road to the left that steeply heads down to the ski lift parking area. Stay right on the more gradually descending road. The road is easy to follow. Just keep going down. 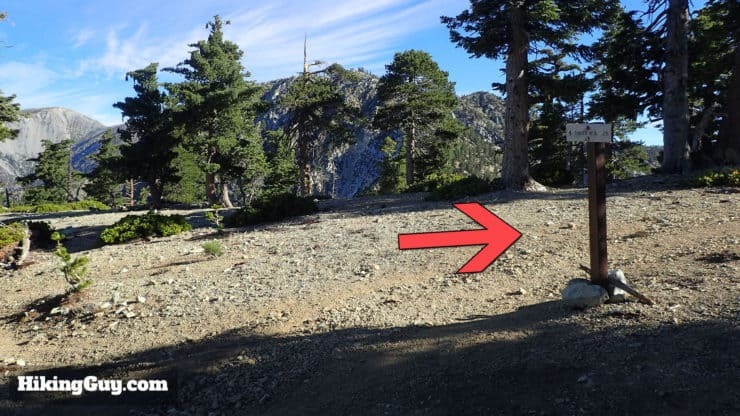 You’ll see the small Ski Hut Trail coming in from the right. Towards the bottom you’ll come to the falls. 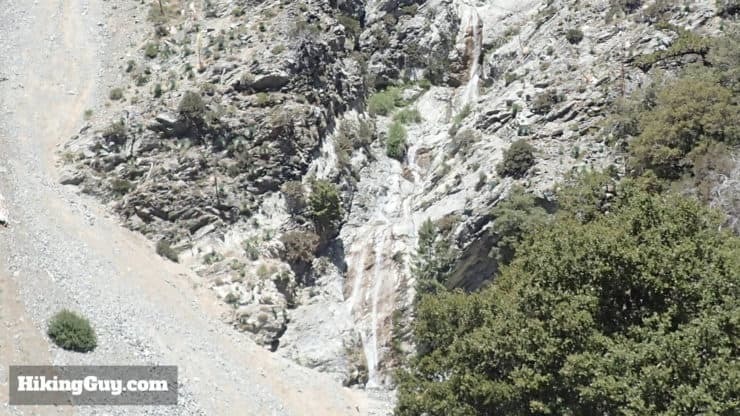 At the falls, the road becomes paved. 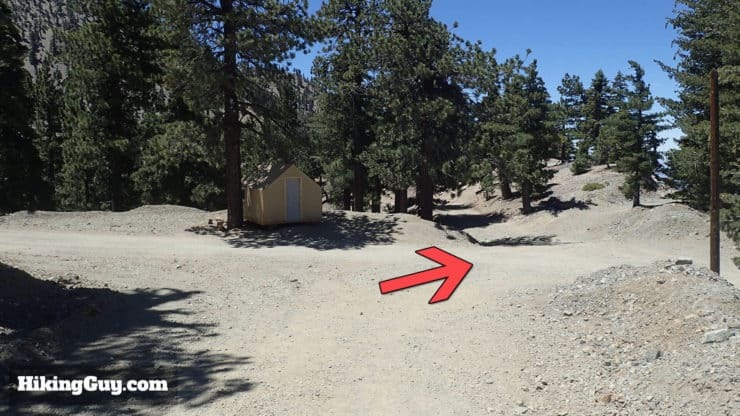 And soon comes out to Manker Flats, where there are porta-potties. 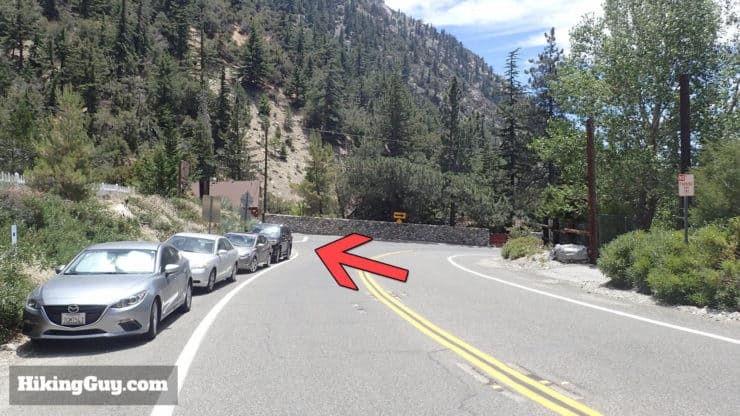 When you come to Mt Baldy Road, make the right. 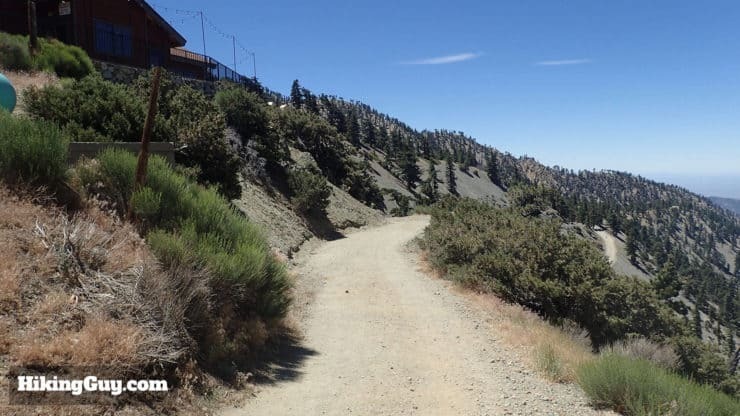 The last stretch of the hike follows Mt Baldy Road down to the Icehouse Canyon Trailhead. 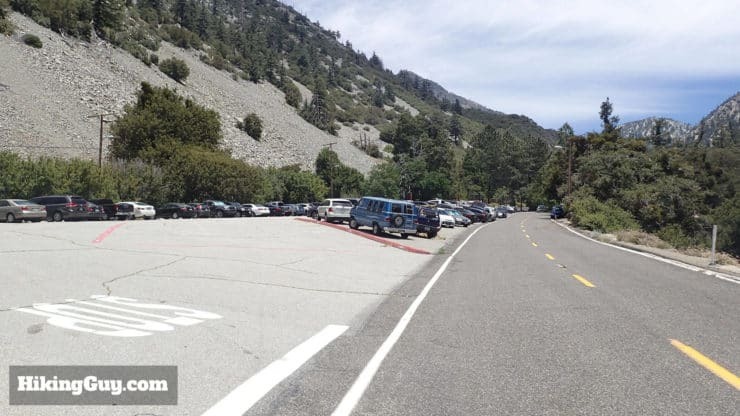 The Manker Flats parking lot is usually pretty full, as it’s the main parking to hike Mt Baldy. 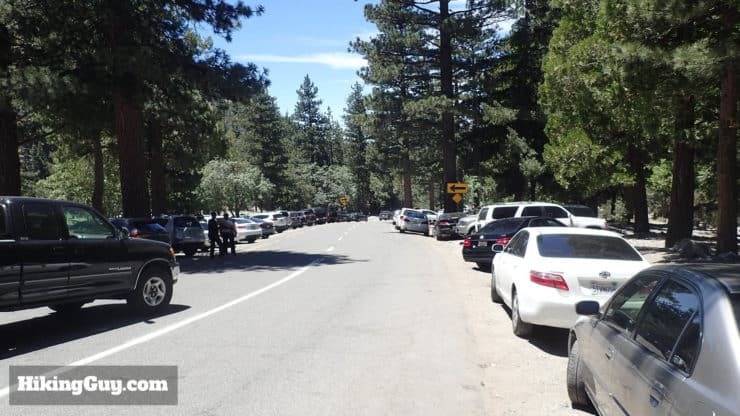 Keep an eye open for traffic as you walk down Mt Baldy Road. Stick to the side with the wide shoulder. 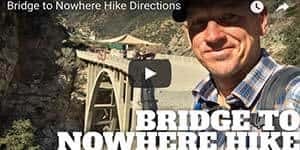 When I did this walk, about a dozen people asked if I needed a ride, so if you want to skip hiking this section, you can probably hitch. 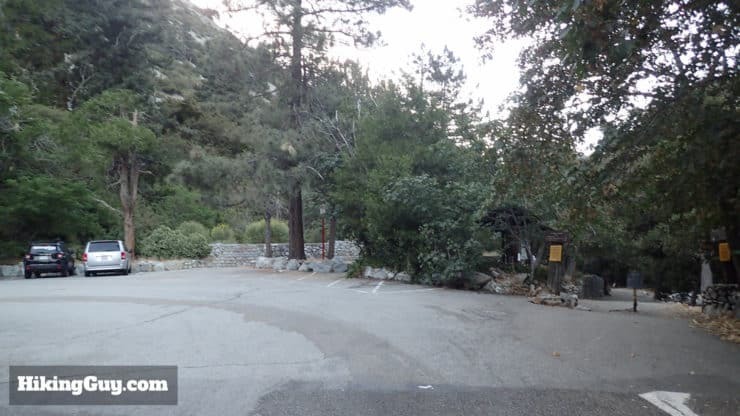 Here you are, back at the Icehouse Canyon Trailhead parking lot. Hope you enjoyed the hike.